Arian Foster ran for 112 yards and a score, while Matt Schaub threw for 225 yards and rushed for a touchdown as the Houston Texans defeated the Jacksonville Jaguars, 24-14. Kevin Walter caught five balls for 70 yards, Owen Daniels hauled in four passes for 60 yards and Jacoby Jones had three receptions for 59 yards for Houston (5-3), which won its second straight game without Andre Johnson after losing its previous two games without the star receiver. 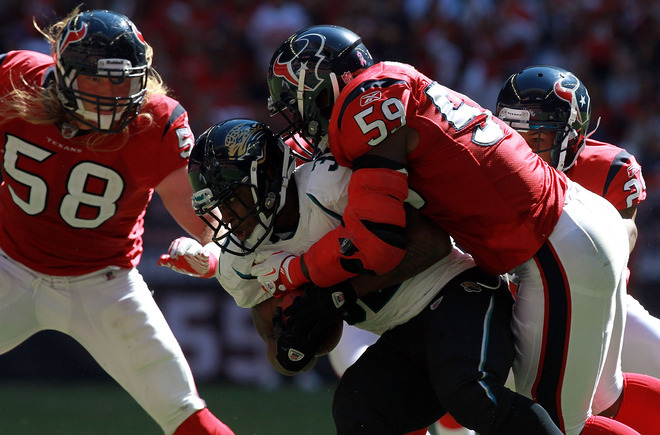 Houston’s defense limited Jacksonville’s offense to just 174 total yards. Blaine Gabbert played through a bruised ribs injury — which he suffered on Jacksonville’s opening drive — and struggled, passing for just 97 yards with a touchdown and two interceptions on 10-of-30 passing. 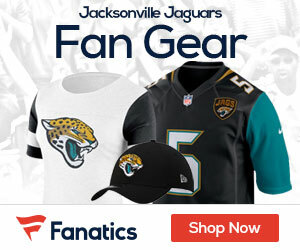 Maurice Jones-Drew ran for 63 yards and a score on 18 carries for the Jaguars (2-6), which couldn’t continue their momentum after a 12-7 victory over Baltimore on Monday night. Jones’ 33-yard punt return set up the Texans in Jacksonville territory at the 44-yard line on Houston’s opening possession of the second half. The Texans took advantage of the short field as Joel Dreesen hauled in a seven-yard TD pass to give Houston a 14-7 lead. Jason Allen intercepted Gabbert’s pass intended for Mike Sims-Walker on the first play of the fourth quarter and the Texans took over at the Jacksonville 40-yard line. Foster extended Houston’s lead to 21-7 with a four-yard score. Ben Tate scampered for an 18-yard run on Houston’s next possession, but Dawan Landry forced a fumble, which Dwight Lowery returned 23 yards to the Texans’ 41-yard line. On the same play, a low block penalty on Daniels moved the ball to the 26-yard line. Gabbert converted a 4th-and-4 with a five-yard completion to Mike Thomas and Jones-Drew got in from two yards out a play later to make it 21-14 with 5:15 remaining in the fourth quarter. Houston went 59 yards in nine plays and ran 4:57 off the clock on its ensuing possession. Daniels caught a 30-yard pass on 3rd-and-5 and Neil Rackers nailed a 39-yard field goal to put the game away with 18 seconds left in the game. Schaub concluded an impressive opening 12-play, 80-yard march which took 6:39 off the clock with a two-yard TD run. Schaub moved the chains on third down twice with a 16-yard strike to Jones on 3rd-and-3, and a 12-yard completion to Foster on 3rd-and-12. Walter also had a key 25-yard reception on the possession. Gabbert scrambled 11 yards to pick up a 3rd-and-10 midway through the first quarter, but was hit simultaneously by safety Glover Quin and linebacker Brian Cushing while sliding. Luke McCown came on at quarterback while Gabbert had his ribs wrapped up on the sideline. After a Houston punt, Gabbert was back on the field and the ribs looked fine as he fired a strike to Jarrett Dillard for a 12-yard gain on the first play of the drive. But once again, the Jaguars picked up just one first down before punting. In a wild play, Clint Session came from the blind side and hit Schaub hard, who fumbled. Matt Roth scooped the ball up at the Houston 30-yard line and lateralled to Terrance Knighton who then flipped to Session who advanced the ball to the Houston eight-yard line. Gabbert found Jason Hill for a five-yard score two plays into the drive to tie the game at seven with 5:41 remaining in the second quarter. Gabbert got the ball back with 4:37 left in the second quarter and led Jacksonville 49 yards to the Houston 23-yard line, but Brian Cushing intercepted Gabbert’s pass intended for Deji Karim at the 21-yard line and returned the pick five yards to the 26. With 1:02 to play until the half, Schaub completed a 17-yard pass to Walter, while Daniels hauled in passes of 11 and 13 yards to set up a Rackers 46- yard field goal attempt. But his kick sailed wide right with four seconds left until halftime.